Dorchester left New York on January 23, 1943, carrying 4 chaplains and about 900 others as a part of convoy of three ships. It was torpedoed by German submarine U-223 off Newfoundland at 12:55 a.m. When Dorchester began to sink, four chaplains of different religions, George L. Fox (Methodist), Alexander D. Goode (rabbi), Clark V. Poling (Baptist) and John P. Washington (Catholic) were helping to calm down the passengers and organized an orderly evacuation. The life vests were passed out to men, but the supply ran out before each man had one. The four chaplains gave their own life vests to others and helped as many men as they could into the boats, then they linked their arms together, saying prayers and singing hymns, went down with the ship. 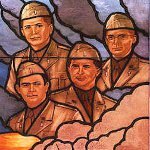 Four chaplains were posthumously awarded by the Purple Heart and the Distinguished Service Cross on December 19, 1944. In 2006 chaplains were awarded by the Medal of Honor. The Four Chaplains' Medal was introduced by Congress on July 14, 1960. These medals were presented posthumously to the next of kin of each of the four chaplains of Dorchester on January 18, 1961. Congress established February 3 as Four Chaplains Day in 1988. This day is observed with official proclamations and, sometimes, flags flying at half-mast.